New paper: How do bees forage for 2 resources? In our new Behavioral Ecology paper, Jake looks at how bees order their collection of pollen (protein) and nectar (carbohydrates). Request a copy on ResearchGate! New paper on pollen learning: real flowers! Our NSF collaboration with colleagues at the University of Arizona (PhD Student Avery Russell, co-PI Dan Papaj and undergraduate Rebekah Golden) has produced a new paper in Behavioral Ecology, involving a first-of-its-kind experiment that explores what floral features bees learn from plants that reward bees with pollen alone. 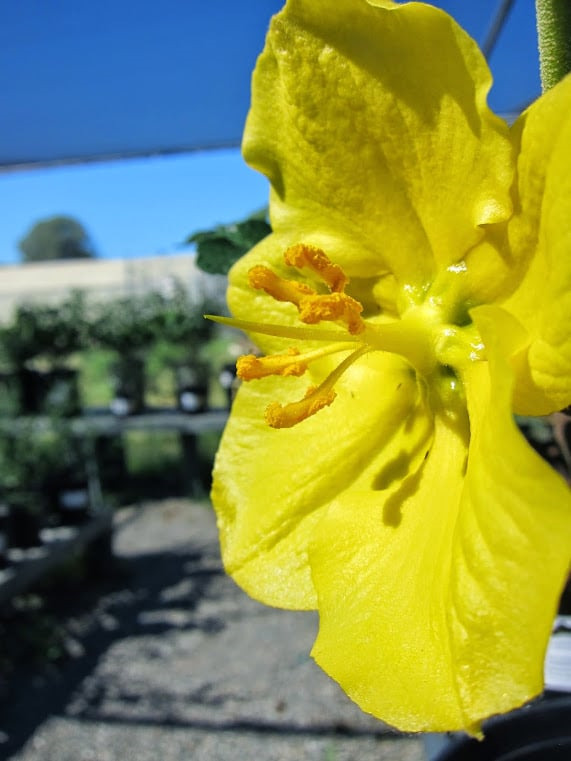 Avery pioneered the "frankenflower" design, which allows him to compare the responses of naive and experienced bees to flowers that have anthers matched or mismatched between Solanum and Exacum plants. Check it out on ResearchGate, or via the journal website. Congrats Avery!! Happy poster presenters and mentors! The 2015 COS Poster competition just wrapped up, and we were pleased to present five posters in the undergraduate and graduate divisions. All did amazingly well, and their posters will soon be on display in our building. Excitingly, Emily was awarded first place, and Cheyenne third place. Congrats to all on a great showing! What floral features do bees learn based on pollen? New paper out! Bees might learn that the colors of petals, anthers, or pollen itself predicts pollen rewards. In our new Animal Behaviour paper (Muth et al. 2016 or try ResearchGate) , Felicity pushed the study of pollen learning forward by 1) demonstrating that bees can learn based on reinforcement by floral-collected pollen and 2) exploring what features of flowers they can learn, and how long they remember these associations. Do bees find themselves "lost in the (floral) supermarket"? New Biology Letters paper out! We're excited about our new publication, "Colour learning when foraging for nectar and pollen: bees learn two colours at once" out today in Biology Letters. It was a fun experience to prepare a short-format manuscript, and Felicity's experiment uncovered some exciting findings about basic aspects of bee foraging. When most people think about bee learning, they think of sugary nectar rewards. However, many bees collect both nectar and pollen (their source of protein) on a foraging trip. Felicity was interested in the cognitive aspects of this "multitasking". At least here when the rewards are on different flowers, bees can indeed learn to associate color + reward type. Doing so may come at a cost, as we found some evidence that bees focusing on a single reward performed better (more on that in forthcoming publications). From the plant POV, it's interesting that bees seem to form expectations about what kind of reward a plant will offer based on its color. Could this have consequences for co-flowering plant species? Our collaborator (and NSF Co-PI) Steve Buchmann's new book is out and available! We're eagerly awaiting our pre-ordered copy, but from the proofs, it looks like we get some nice shout-outs, and the book is already getting some national press. It's been a difficult time in lab, with the sudden passing of one of our undergraduate REU students, Harvi Singh. Harvi had been a part of our close-knit lab for the last year, helping Felicity with experiments on pollen-related learning. His bee cookies were legendary, and we all mourn the loss of his kind and creative spirit. 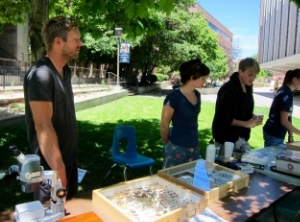 We had a soft open for the UNR Pollinator Garden this week, as part of our celebration of National Pollinator week (earlier, Jake Francis gave a public lecture at Urban Roots). The effort was coordinated by US FWS rep. Sarah Kulpa, and went off without a hitch! We had honey tasting, face painting, bee costumes, lemonade, free plants and seeds from the US FWS office, the NV Native Plant Society, and live bugs from NV Bugs and Butterflies. Although it was pretty hot out, we stayed cool with a live bumblebee colony under a shade tree, and showed off some of the UNR Natural History Museum's bee and butterfly collections. We counted about 185 visitors to the "live bees!" table. What a great day!! This summer, our lab is hosting the inaugural Daugherty Fellows, a group of education students who will be spending time in the lab and shadowing Jake Francis in the field. This program is intended to enhance the scientific exposure of future Biology teachers in N. Nevada, and is funded by the Daugherty Foundation. We had our first field foray a few weeks ago, and I think these pictures capture the fun we had. This program is being run by Sierra Nevada Journeys-- read more about it through their blog entry. Congratulations to Leonard lab graduates! Amanda Scampini and Brandy Reynolds completed their senior theses, giving excellent presentations to the department and receiving super cool medals that we are all jealous of. Congratulations to Amanda! She was awarded first place in the Sigma Xi Student Research Showcase (Physiology & Immunology Undergraduate Division). Amanda heroically/skillfully filmed herself narrating a slideshow, and maintained a blog about her project where she answered judges' questions. "A Better Nectar" art exhibit by Jessica Rath is also now open at the Cal State Long Breach Art Museum. Our lab has had a lot of fun consulting with Jessica on this amazing project, and we can't wait to check it out when we head down for a panel discussion on March 26th. A major theme is the disconnect between different sensory worlds, and how we attempt to study communication between bees and flowers. We can't wait to "shrink down" and explore the nest! Here's a press release and a nice write up of the work. March Update: We had a fabulous time traveling down to the show, and participating in a panel discussion. The exhibit is getting some even broader press, via LA Weekly. A campus reporter, Helen Zhao, also produced a great short about the show. Our paper on how secondary compounds in floral nectar affect bumble bee parasites (self-medication project) is now out in Proceedings B: Biological Sciences! It's getting some neat press as well. Leif wrote a nice piece about "floral pharmacies" here, and it was featured as a Nature "Research Highlight" as well. Two papers on the use of vibration in learning experiments are now out! Muth, F., Scampini, A.V. *, and Leonard, A.S. 2015. 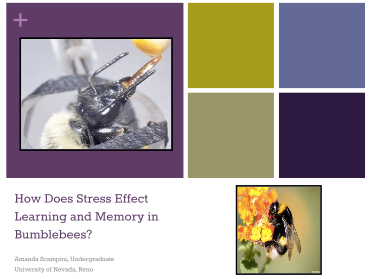 The effect of acute stress on learning and memory in the bumble bee. Learning and Motivation. This spring, we've been involved in creating the UNR Pollinator Garden in the FA Courtyard. 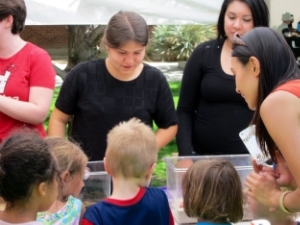 This exciting project is in concert with the US FWS office's "Schoolyard Habitats" program, the UNR Museum of Natural History, and the UNR Arboretum. An exhibit at the Oakland Museum of California, Bees: Tiny Insect, Big Impact is now up and running through Sept. 2015! I can't wait to check it out on my next trip. The exhibit features videos of our NSF-funded work on buzz pollination. Annie and Amanda sung (not literally) the praises of UNR to prospective students and their parents at this recruitment event. A cool opportunity to reflect on what makes UNR great and why we're all here.